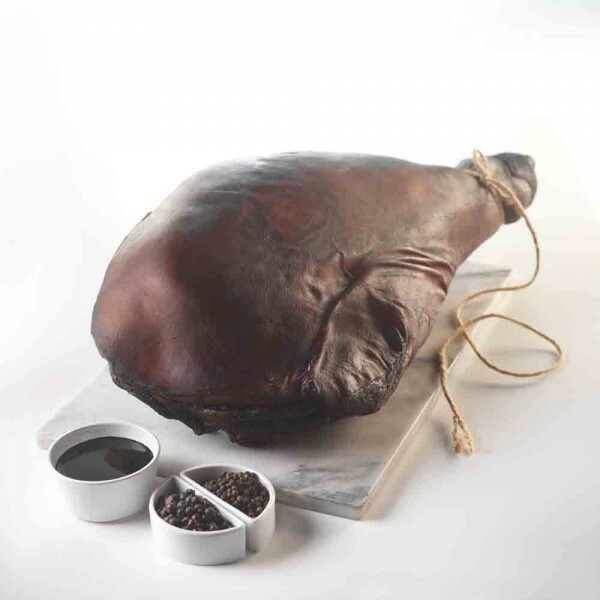 Dry cured and coated with a mixture of carefully blended spices, juniper berries and molasses which permeate the ham. Made to a recipe created by Lord Bradenham back in 1781, this ham will appeal to those who are looking for something really special. Like the York, this is a dry-cured ham. What sets it apart, however, and lends the uncooked ham its distinctive black rind, is a fortnight spent soaking in a special marinade of molasses, juniper and spices. The hams are then left to mature for three months, during which time they develop their robust and distinctive flavour. Produced with only British pigs.